The Alabang Town Center branch of Cabalen was officially re-launched today, October 26, 2017. A bigger and more illuminated restaurant space awaits Cabalen patrons and mallgoers. The mirror-laden walls amidst the open dining areas create an illusion of wider spaces. The chandeliers hanging from ceiling gives Cabalen that added touch of elegance. 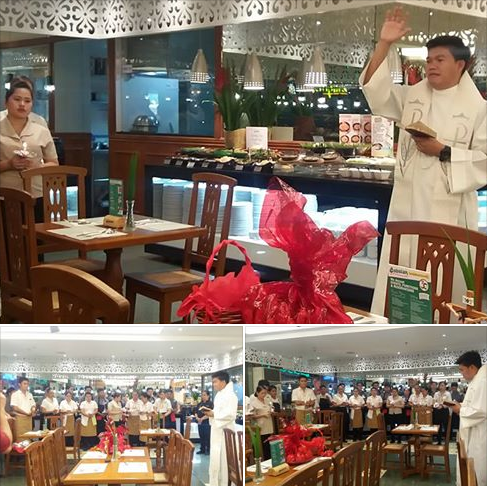 And to kick off the occassion, a priest offiated the restaurant blessing. A ribbon cutting ceremony shortly followed next. Steamed, boiled, fried, grilled or broiled, Cabalen buffet spread items are infinitely delicious. They offer beef bulalo at the soup station. The salad station offers varied concoctions and one side allows patrons to make their own using garden-fresh veggies that includes chopped tomatoes, cucumbers, lettuce, carrots, watercress, onions, and parsley with one's choice of salad dressing. They also have soft tortillas for you to wrap them in. 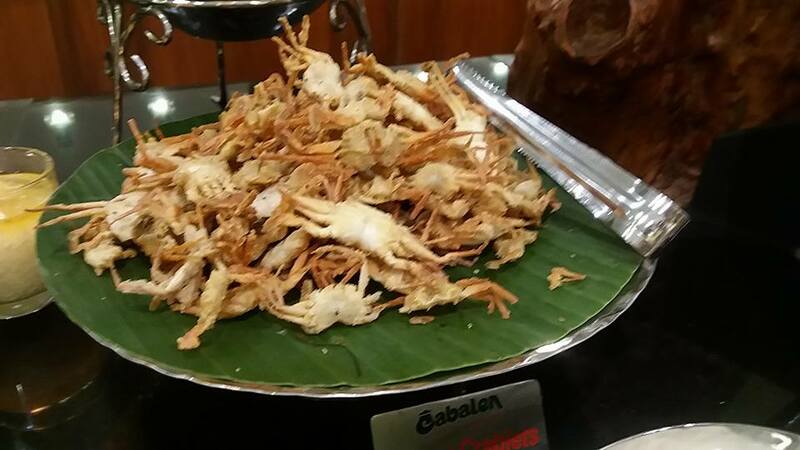 There is okoy, crispy kang-kong, crunchy crablets plus a variety of vegetable tempura to perk up one's appetite. There are steamed vegetables like eggplant, ampalaya, okra etc. 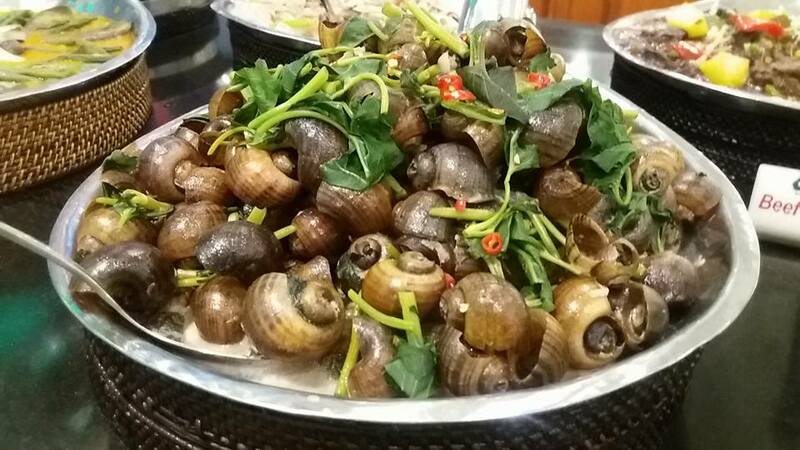 which goes well with grilled seafood (fishes, crabs) and meat skewers (chicken, pork). 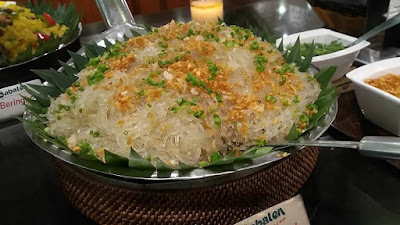 The Kapampangan burong hipon (shrimp with fermented rice) or burong aligue (crab fat with fermented rice) that gives texture to these dishes, completing the degustation experience. 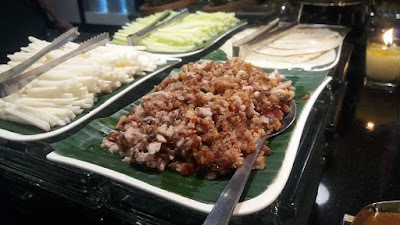 Sisig lovers may choose from Tofu, Pork, Chicken and Bangus Sisig variants which they serve in small iron skillets upon order. Those craving for Lechon Kawali will love the deep-fried, crispy pork cheek that’s halfway chewy and tender! These moist, crispy meat cracklings were done just right. Whether in minced or cutlet forms, biting into it was heavenly! 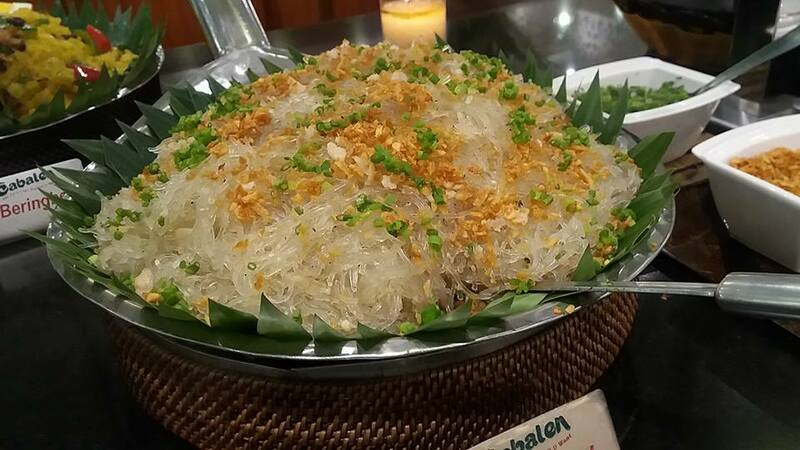 Cabalen serves its main dishes in large woks. 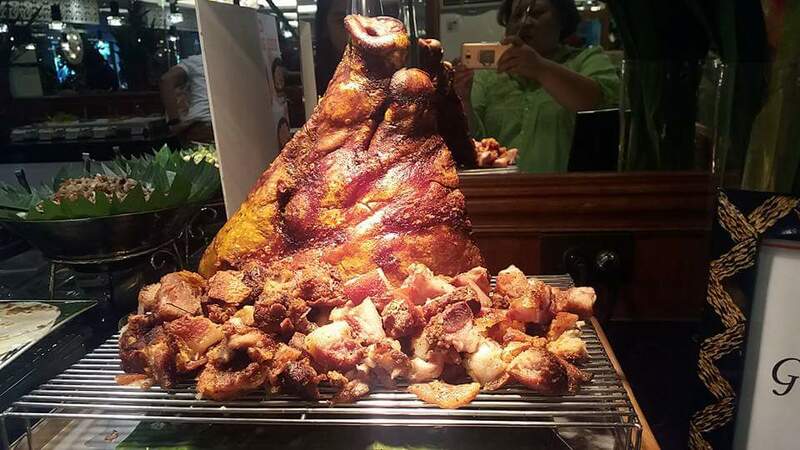 Viands include Chicken Adobo, Ginataang Langka (jackfruit in coconut milk), Ginataang Kuhol (golden apple snails are cooked in coconut milk), Dinuguan (pork stew) Kare-Kare (tripe cooked in peanut sauce), Beef Caldereta, Pinakbet (sauteed mixed vegetables), Beringhe (Pampanga's version of paella), and Pancit Puti. 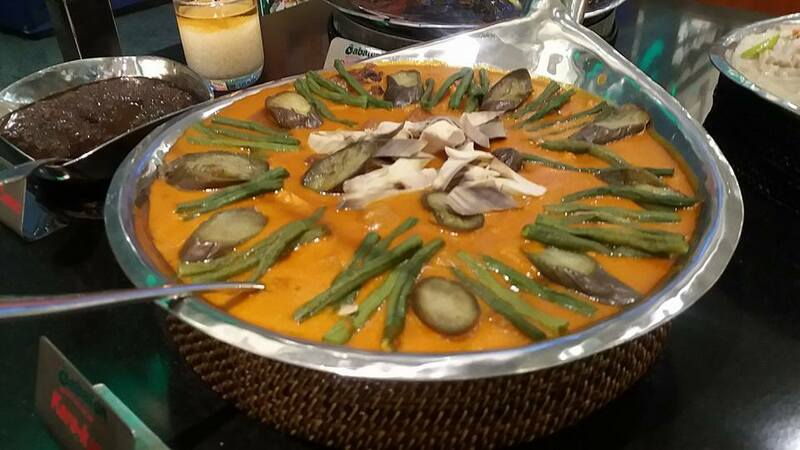 I had several servings of my favorite Kare-Kare with their in-house bagoong. My daughter helped herself with her favorite Dinuguan and Caldereta. Surprisingly, she loved Ginataang Kuhol after trying it for the first time. Coconut milk seems to bring those brash savory notes that she loves. She had two bowls that were gone too soon! At the dessert table, there were fresh fruits (banana, dalandan, pineapple, watermelon) biko, guinatan, minatamis na saba and hibok-hibok to satisfy one's sweet cravings. I went in for sliced fruits and a serving of Guinatan to cap my meal. My daughter had her marshmallows dipped in the chocolate fondue. Halo-Halo lovers would love their Guinumis selection. It is a DIY beverage that allows one to mix up ice desserts from minatamis na saba, sago, gulaman, toasted pinipig, white and brown beans. Bottles of sugar syrup, fresh milk and coconut milk are made available on the side to make that perfect Guinumis concoction based on one's preferences. 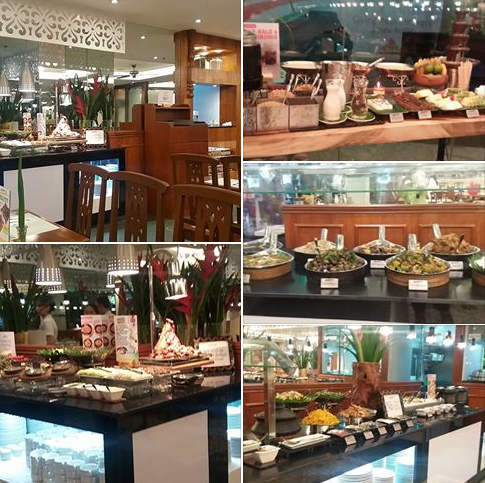 I recommend Cabalen to all-you-can-eat enthusiasts for an amazing Filipino feast!